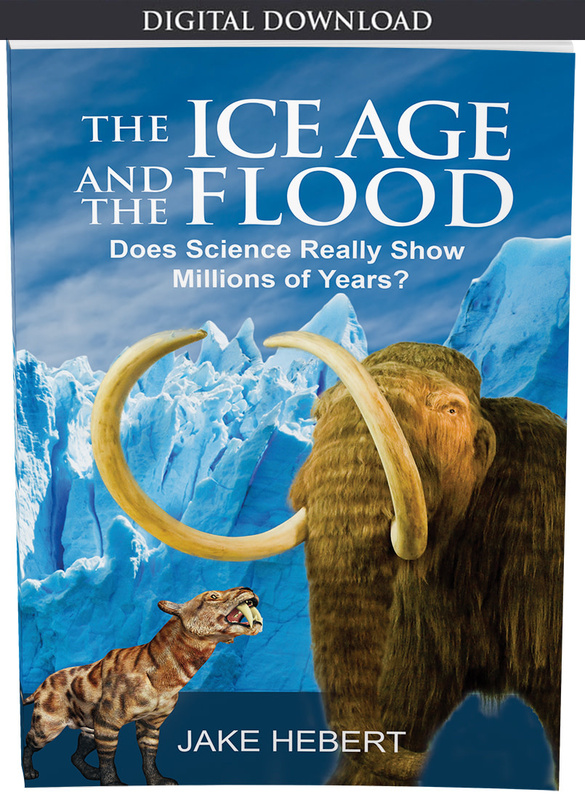 The Bible, with its short 6,000-year timescale and account of a global flood, is the key to explaining the Ice Age. Not much has changed since then. 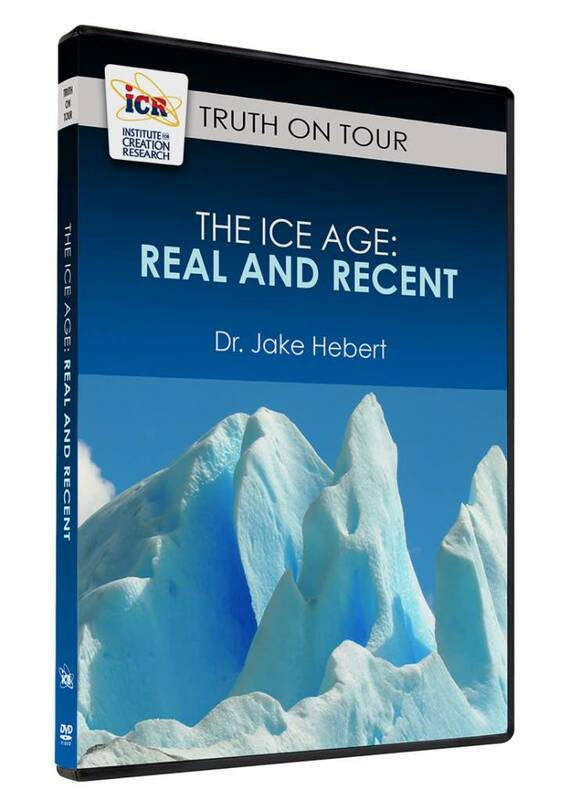 The precise causes of ice ages “remain controversial”3 and are “not completely understood.”4 Secular scientists continue to propose new explanations,5 which is an indication that none of the current ones are very convincing. Of these explanations, the astronomical (or Milankovitch) ice age theory is the most popular. It holds that slow changes in Earth’s orbital and rotational motions cause differences in the way sunlight falls on the earth’s surface. Supposedly these differences control the timing of ice ages. 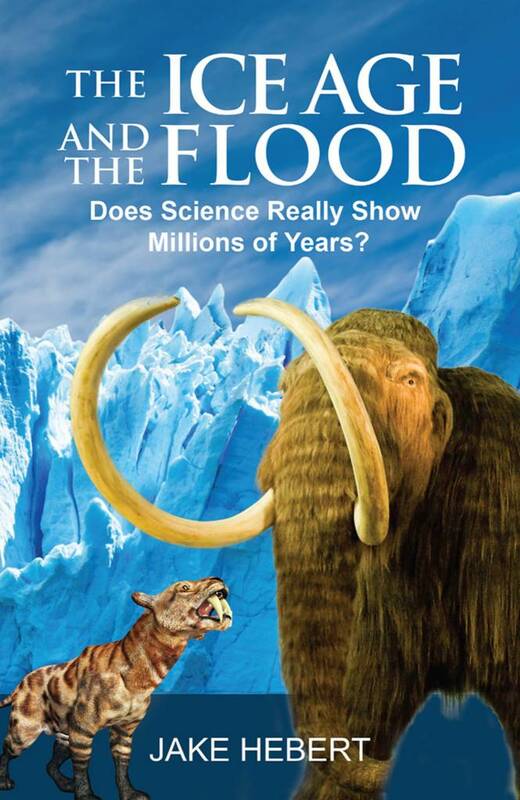 Creation scientist and meteorologist Michael Oard has presented strong arguments that the Genesis Flood caused the Ice Age.10,11 Most creationists think that during the Flood the original ocean floor was rapidly subducted into the earth’s mantle and was replaced by new seafloor that formed at the mid-ocean ridges. The heat from the newly formed seafloor significantly warmed the world’s oceans, resulting in greatly increased evaporation from the sea’s surface.12 This dramatically increased the moisture in the atmosphere and led to greater precipitation, including more snowfall at high latitudes and on mountaintops. Figure 1. 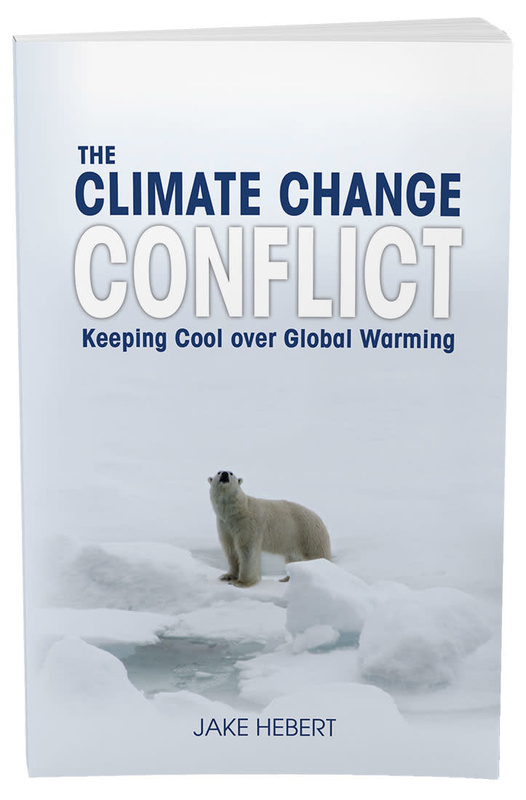 Warm oceans resulting from the Genesis Flood dramatically increased snowfall on mountaintops and in the polar regions. Aerosols from residual post-Flood volcanic activity provided the cooler summers needed to prevent winter snow and ice from melting, allowing the formation of thick ice sheets. Subduction zone volcanoes continued to erupt for centuries after the Flood, gradually decreasing in number and intensity. 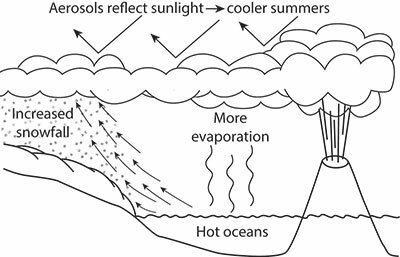 They ejected aerosols (tiny particles and droplets) into the atmosphere that reflected significant amounts of sunlight, resulting in cooler summers that prevented winter snow and ice from melting. As the snow and ice accumulated year after year, thick ice sheets formed (Figure 1). Likewise, recent volcanic eruptions have demonstrated that large, explosive, sulfur-rich eruptions can cause noticeable global cooling, particularly during the summer and autumn months.15 Both creation and secular scientists agree that past volcanic activity dwarfed anything we see happening today, so these past eruptions definitely had the potential for dramatic summer cooling. 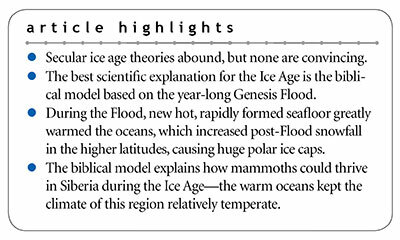 If this scenario makes sense, why can’t secular scientists use warm oceans and volcanic cooling to explain the Ice Age? First, it would take an enormous amount of energy to significantly warm the world’s oceans. This would require cataclysmic conditions that violate their uniformitarian assumption that “the present is the key to the past.” But the Genesis Flood, which they deny, is an ideal candidate for such ocean warming. Likewise, secular scientists cannot invoke volcanic cooling because of their belief in millions of years of Earth history. They insist that large eruptions—which are known to have occurred—were separated from one another by vast ages. Hence, any cooling they might have provided would be greatly diluted by the assumed long ages between eruptions. This is a clear example of how a belief in millions of years hinders scientific research. Many Ice Ages or Just One? Figure 2. Because secular scientists have counted about 50 chemical wiggle cycles that they date as younger than 2.6 million years, they claim there were 50 or so Pleistocene ice ages. Data obtained from reference 17. The main argument for 50 Pleistocene ice ages is, believe it or not, a Milankovitch interpretation of chemical measurements obtained from deep-sea sediment cores. Secular scientists used 57 deep-sea cores to construct a composite “stack” of chemical data called oxygen isotope, or δ18O, values that supposedly covers the last 5.3 million years of prehistory.17 These scientists think each oxygen isotope “wiggle” cycle represents a cold/warm ice age-interglacial cycle. They simply counted the number of cycles dated as younger than 2.6 million years. Since they counted around 50 wiggles (Figure 2), voilà!—there were 50 supposed Pleistocene ice ages! But as noted earlier, evidence for the Milankovitch theory is weak at best. Michael Oard’s biblical model also solves another major mystery of Earth history: How did millions of wooly mammoths (Figure 3) thrive in Siberia during the Ice Age? There is strong evidence that large numbers of these animals lived there during this time. Today winters in Siberia are bitterly cold. Lows of -40°F are typical, and temperatures colder than the surface of Mars have been recorded.20 How could even the wooly mammoths have endured such temperatures? Moreover, secular scientists think that Earth is currently in a warm interglacial period, so Siberian Ice Age temperatures would presumably have been even colder. Even if mammoths could somehow tolerate those temperatures, how could these huge creatures find sufficient food and water in such a harsh climate? And a number of factors, such as long gestation times, would have made it difficult, if not impossible, for mammoths to migrate to warmer areas during the Siberian winters. Figure 3. 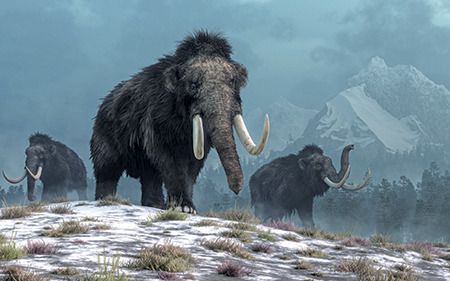 The biblical Ice Age model solves a number of wooly mammoth mysteries. Secular scientists can’t use this simple explanation because according to their evolutionary story, Arctic sea ice has been present for at least the last 100,000 years,21 long before the time they think the mammoths went extinct about 10,000 years ago. This means that according to the secular model, Arctic sea ice was present while the mammoths lived in Siberia. With sea ice present and warm oceans absent, Siberia would have been as cold as it is today, if not more so. So again, secular scientists’ belief in millions of years prevents them from seeing a straightforward explanation for this well-known mystery. Christians don’t need to accept the millions of years projected by secular scientists. Christians don’t need to accept the millions of years projected by secular scientists. Time after time, the scientists’ deep-time theories fail to provide adequate explanations. The biblical timeline, however, is a different story. It is not a problem or an embarrassment for which Christians need to apologize. Rather, it’s the key to making sense of Earth’s history! Oard, M. J. 2006. Frozen in Time. Green Forest, AR: Master Books. Watson, T. 1997. What causes ice ages? U.S. News & World Report. 123 (7): 58-60. Ice age. New World Encyclopedia. Posted on newworldencyclopedia.org, accessed December 12, 2016. Ice Ages. BBC. Posted on bbc.co.uk, accessed December 12, 2016. University of Royal Holloway London. New theory on cause of ice age 2.6 million years ago. ScienceDaily. Posted on sciencedaily.com June 27, 2014, accessed September 7, 2018. Hoyle, F. 1981. Ice: the Ultimate Human Catastrophe. New York: Continuum, 77. Hebert, J. ‘Big Science’ Celebrates Invalid Milankovitch Paper. Creation Science Update. Posted on ICR.org December 26, 2016, accessed September 7, 2018. Hebert, J. More Problems with Iconic Milankovitch Paper. Creation Science Update. Posted on ICR.org July 13, 2018, accessed September 7, 2018. Oard, M. J. 1990. An Ice Age Caused by the Genesis Flood. Santee, CA: Institute for Creation Research. Oard, M. J. 2005. The Frozen Record. Santee, CA: Institute for Creation Research. Bradley, R. S. 1988. The Explosive Volcanic Eruption Signal in Northern Hemisphere Continental Temperature Records. Climatic Change. 12 (3): 221-243. Oard, M. J. 2015. Only one glaciation observed in western Alberta, Canada—the ice-age reinforcement syndrome. Journal of Creation. 29 (2): 12-13. Lisiecki, L. E. and M. E. Raymo. 2005. A Pliocene-Pleistocene stack of 57 globally distributed benthic δ18O records. Paleoceanography. 20, PA1003. Molén, M. 1990. Diamictites: Ice-Ages or Gravity Flows? In Proceedings of the Second International Conference on Creationism, Technical Symposium Sessions. R. E. Walsh and C. L. Brooks, eds. Pittsburgh, PA: Creation Science Fellowship, 177-190. Oard, M. J. 2009. Landslides Win in a Landslide over Ancient “Ice Ages.” In Rock Solid Answers: The Biblical Truth Behind 14 Geological Questions. M. Oard and J. K. Reed, eds. Green Forest, AR: Master Books, 111–123. Rice, D. So you think you’re cold? How does 88 below zero sound? USA Today. Posted on usatoday.com January 17, 2018, accessed September 10, 2018. Johnston, I. Arctic could become ice-free for first time in more than 100,000 years, claims leading scientist. The Independent. Posted on independent.co.uk June 4, 2016, accessed September 10, 2018. Some have speculated that the wooly mammoths were “quick frozen” as temperatures rapidly dropped to -150°F. Although this idea was once popular, Michael Oard’s model is a better explanation for the data, which includes partially preserved food found in mammoth stomachs. The wooly mammoths did succumb to colder temperatures, but such a stupendously rapid temperature drop is physically unrealistic and isn’t needed to explain the data. Cite this article: Jake Hebert, Ph.D. 2018. The Bible Best Explains the Ice Age. Acts & Facts. 47 (11).